The success of this event is not just in the massive turnout, but also in the fact and Toronto's sclerotic press covered this event. Nearly 100 people hit the street and stopped traffic on Jane Street at Finch Avenue Saturday, Sept 12. The group marched along Jane Street, building community gardens along the way as part of the Jane and Finch street takeover, organized by Black Creek Food Justice, a sub-committee of the Black Creek Community Garden. The march was organized as an action to demand that food is a human right for all. 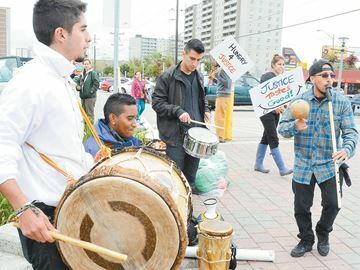 “We totally took over the street and stopped traffic and had our placards and signs with our demands, which are to make healthy food more accessible to racialized communities and the poor, to stop having police and security guards in our grocery stores,” said Suzanne Narain, one of the organizers. She said the event, which started with some drumming and speakers to inspire the march, was a success. The group marched along Jane Street, stopping once in a while to plant a community garden along the street. “We want the neighbourhood to know that we were able to plant food in our community on plots of land that are available,” Narain said. “We’re hoping the community takes care of the gardens.” The organization planted such things as lettuce, spinach, kale and calliloo, a leafy green vegetable often used in Caribbean dishes. “The Jane and Finch community is one of the most expensive to buy healthy food. We wanted to use the green space that we have available to make healthy alternatives open to our community,” Narain said. The group said too many people in Toronto, particularly people of colour and those in low-income areas, have insufficient access to healthy food. They call on all levels of government to address the issue and help make healthy food accessible to all. The group also calls on government to address the issue of inadequate wages, which makes it impossible for some to afford good food, to address the government’s lack of support for growing food in the community and to end the discrimination in the food system based on race and mental or physical health challenges. The group marched from Jane and Finch to the Driftwood Community Centre.